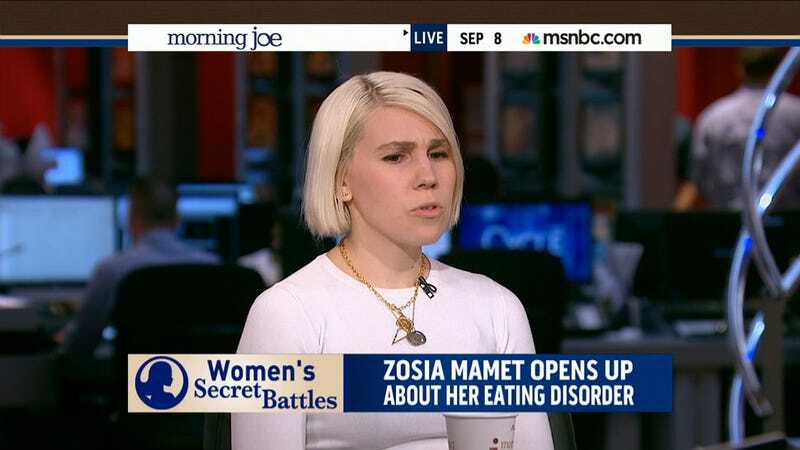 Zosia Mamet talked about her eating disorder battle on MSNBC's Morning Joe today. The Girls actress revealed how her father, famous playwright David Mamet, called out her addiction one day, saying "You can't die" to try and stop her from hurting herself. In that moment, Zosia said she realized that her "addiction wasn't only about me." Mamet began a column in Glamour last year and dug into this topic in her latest installment. On MSNBC, she said her disorder made her feel as if she "didn't care if I lived or died because I was powerless in that moment" but she realized how much it would affect her loved ones.